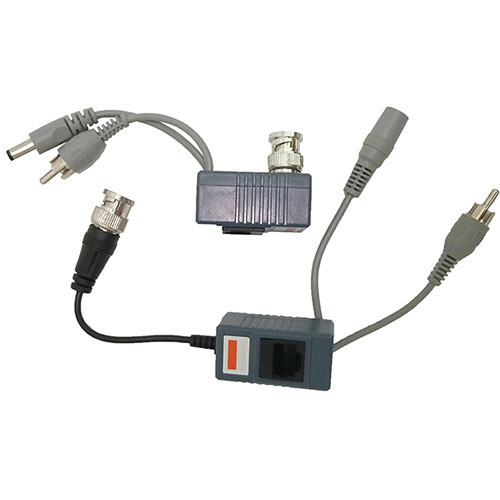 This two-piece MG Electronics MG-42P Passive Video Balun allows you to transmit analog video and audio over a Cat5/6 cable to simplify surveillance camera installation over long distances using TIA / EIA-568B Standard. One part of the balun installs at the camera with a BNC video-in connector, an audio-in jack for external mic or audio-enabled cameras, and 12VDC power for the camera (which eliminates the need for a local power source). The second part installs on the cable at the monitor station with matching input/output terminals to feed the video and optional audio to the recording device and to accept the power for the camera. Box Dimensions (LxWxH) 5.4 x 3.5 x 0.7"
MG-42P 1-Ch Passive Video Balun is rated 5.0 out of 5 by 1.